At one time or another most of us have felt overwhelmed by anxiety or unable to stop worrying obsessively. Sometimes there’s a specific focus and a vivid response--we wake up in the night with a start, our mind racing, fixated on a recent argument or a stalled project or an avoidable mistake. Sometimes the experience is more more generalized--a gnawing sensation distracts us, and our mind drifts away into a black cloud of concern. And attention is tremendously powerful: whether we’re laboring at a task, reflecting and learning, or interacting with others, the amount of attention we can bring to bear on that experience usually determines how effective we are at accomplishing our goals. So when anxiety causes us to devote a surplus of this precious and limited resource to objects unworthy of our attention, we undermine ourselves in any number of ways. There are two underlying dynamics at work here: 1) the power of emotion to capture our attention, and 2) the difficulty of controlling our thoughts and directing our attention. As I wrote in 2015, "psychologist Victor Johnston describes emotions as 'discriminant hedonic amplifiers,' meaning that they boost various signals in our mental landscape, drawing our attention toward certain issues and events and away from others. In other words, emotions are attention magnets." This is one of the most important functions served by emotions; they nudge us (and sometimes shove us) in directions that are likely to ensure our continued survival, toward sources of health and happiness and away from threats to our safety or enjoyment. Note the emphasis on likely; as neuroscientist Joseph LeDoux has written, emotions are a "quick and dirty processing system" that allow us to rapidly assess the potential impact of a given situation on our health and happiness, but our intuitive emotional response to a given situation isn’t always accurate. Emotions don’t work in opposition to our logic; work in recent decades by neuroscientists such as LeDoux and Antonio Damasio, among others, has made it clear that emotions play a crucial role in our reasoning process, and the quality of our decisions generally improves when we're in more in tune with our feelings. But not always--and anxiety that fails to serve a useful purpose is a perfect example of the power of emotion. In many cases we know that our concern is misplaced, or at least disproportionate to the risk we face from the object of our anxiety--but that knowledge offers only limited resistance to the power of anxiety. The second dynamic at play when we’re distracted by anxiety is the profound difficulty of controlling our thoughts and directing our attention toward certain objects and away from others. The late Harvard psychologist Daniel Wegner was an authority on this process, known as mental control. His research shows that conscious efforts to evoke or avoid specific mental states and direct our attention can work, but they can also backfire, particularly when we’re trying to suppress thoughts, resulting in the "the very mental states we are trying to avoid." And yet we must constantly filter out and ignore vast amounts of information. As neuroscientist and psychologist Ian Robertson has noted, "We have to inhibit the billions of bits of irrelevant information assailing our senses in order to concentrate on the fragments of information which are crucial for us at a particular point in time." This highly selective focus is what makes it possible for us to complete any task, from driving a car to writing a sentence to having a conversation. But it’s a process that requires substantial cognitive effort under the best of circumstances, and when we’re tired or stressed our capacity for mental control is substantially impaired. Our anxieties often take advantage of both of these dynamics, seizing us in their powerful grip when our ability to resist them is at a low ebb. So what can we do? First it's important to embrace what Stanford psychologist Carol Dweck calls a growth mindset, a view of ourselves in which we see our skills and abilities as subject to development, rather than a fixed mindset, in which we view such traits as inherent and impossible to change. Dweck’s research shows that people with a growth mindset are more resilient when experiencing a setback and more persistent in the face of obstacles, and both of these qualities can be valuable assets when seeking to overcome anxiety. As I've written before, Dweck's work suggests that it's possible to adopt a growth mindset, and this begins with simply being aware of the difference between the two mindsets. We can also pay attention to our inner dialogue and look for signs of a fixed mindset, particularly any messages regarding our difficulty in dealing with anxiety. When we hear such messages, it’s important to challenge their accuracy and not simply accept them at face value. Substantial research in recent years has shown that our brains continue to develop throughout our entire lives, and this property of neuroplasticity insures that change is almost always possible, even though it’s often difficult. Once we see ourselves as capable of change, there are a number of steps we can take to manage our emotions more effectively and mitigate anxiety’s ability to capture our attention. Note that emotion management is different than suppression; the latter is a futile (and even counterproductive) effort to ignore our feelings or deny their existence, while the former is a productive strategy of active engagement. Emotion management starts with heightening our ability to sense what we’re feeling. Emotions such as anxiety begin as physiological events--the release of neurotransmitters in our brain or visceral muscular contractions--before they register in our consciousness. The shorter the gap between those events and our conscious awareness of what we’re feeling, the more control we can exert over how we are likely to respond to those feelings. Practices such as regular exercise, sufficient sleep, and meditation help us attune to our bodies and the physiological manifestations of our anxiety. Once we can better sense our emotions as physical experiences, we can improve our ability to comprehend them, to label them with the appropriate words that allow us to translate what we’re (literally, physically) feeling into (conceptual) feelings. One simple way to start is to expand our emotional vocabulary. It’s critical to distinguish the subtle variations in our feelings, particularly when identifying their depth and intensity. When we label all anxiety as a form of fear, and fail to differentiate among, for example, tension or nervousness or excitement, we frame the situation in a particular way, which has an impact on our behavioral response. Saying to ourselves, "I’m tense," or "I’m nervous" or "I'm excited" can put us in a very different state of mind than saying, "I’m scared." An improved emotional vocabulary allows us to more clearly articulate what we’re feeling to others, which serves several purposes. Research by neuroscientists Matthew Lieberman, Naomi Eisenberg and others has shown that talking about our feelings allows us to better manage difficult emotions such as anxiety by reducing activity in the regions of the brain associated with those emotions. Openly stating what we’re feeling is also critical in helping others understand us and respond appropriately. We’ve evolved a finely-tuned ability to be aware of others’ emotions, but we can’t necessarily interpret the precise nature and cause of those feelings. When we’re anxious it’s essential to talk about it, which will tend to both make it easier for us to regain control over the emotion and invite others to provide support. Note that our ability to hold these conversations is a function of the surrounding cultural context. Different relationships, families, organizations, and nations have vastly different attitudes toward emotions, so it’s important to establish norms that make it acceptable for us to talk about our anxieties. Sensing, comprehending, and articulating our emotions more effectively ultimately allow us to express those feelings in more productive ways. Anxiety pulls us off course when we’re not attuned to its physical symptoms, when we label it incorrectly, or when we elect not to talk about it with others. When we’re anxious but unaware, when we mistake anxiety for deeper fears, or when we sit alone with our feelings, we’re more likely to seek comfort in counterproductive behaviors, including obsessive rumination. Improved emotion management helps us choose healthier outlets for our anxiety--a long walk, a heartfelt conversation, or just a good cry. In addition to loosening anxiety’s grip through improved emotion management, we can improve our attention management by strengthening our ability to control and direct our thoughts. Health journalist Lea Winerman covered a presentation by Wegner at the 2011 convention of the American Psychological Association, in which he described several strategies for mental control. In the moment Wegner recommends that we minimize multi-tasking, which diminishes our cognitive load, frees up finite working memory and increases our ability to focus. In my work as a coach it’s evident that leaders who are able to ignore low-value demands on their time and focus on more important tasks are better able to manage the inevitable stresses and anxieties that accompany leadership roles. The leaders I’ve worked with who’ve successfully guided their organizations through times of crisis also emphasize the importance of minimizing interruptions in order to devote their full attention to the task at hand. When we try to tackle multiple tasks at once or allow unwanted distractions to clutter our mental landscape, not only are we likely to perform less effectively, we also make it more difficult to direct our attention toward productive work and away from fruitless worry. Wegner also suggests identifying an "absorbing distractor" that will prevent us from becoming fixated on a more problematic focal point. If we can arrest our anxiety before we’re deeply in its grip, we can redirect our attention elsewhere away from the object of our concern. This can involve substituting an immersive activity for worrying, such as intense exercise or a stimulating cognitive task, or it can involve re-focusing our anxiety on a more useful object--an alternative issue that we have more control over. Over time, Wegner recommends that we build our capacity to resist distraction by committing to address unwanted thoughts during some designated period. Winerman notes that chronic worriers who set aside 30 minutes a day during which they were free to worry experienced less anxiety during the rest of their day. A related option is some form of journaling, which can be particularly helpful in processing emotions such as anxiety. The class I teach at Stanford, The Art of Self-Coaching, as well as other classes I've taught in the past, such as Interpersonal Dynamics and Leadership Labs, all involve putting students through a range of challenging situations and then asking them to write about their experience, which serves in part to help them manage any difficult feelings that have been triggered. And many of the leaders I coach in my practice find that taking just a few minutes in the morning or evening to jot down some notes is sufficient in helping them process the events of their day and avoid unnecessary worry. Finally, Wegner also notes that meditation and other mindfulness techniques help with mental control, a view that has become increasingly mainstream as researchers such as Jon Kabat Zinn of the University of Massachusetts Medical School and neuroscientist Richard Davidson of the University of Wisconsin have demonstrated its beneficial effects. In 2009 I heard Harvard Business School professor and former Medtronic CEO Bill George discuss his 30-year commitment to a daily meditation practice, and today it’s something I discuss with most of my clients and students. A popular misconception about meditation is that it involves relaxing into some sort of bliss, but Kabat Zinn describes meditation as a "mental workout." Our minds wander constantly as a steady stream of thoughts enter and exit consciousness, and most meditation practices involve a steady--and difficult--process of returning our attention to a focal point, such as the breath, after every distracting thought. Just we grow stronger by lifting weights repeatedly, the intensive effort that meditation requires builds our capacity to notice when we’re distracted and re-direct our attention, a critical skill when seeking to avoid unproductive anxiety. Photo by Joel Penner. Yay Flickr and Creative Commons. In a fixed mindset, people believe their basic qualities, like their intelligence or talent, are simply fixed traits. They spend their time documenting their intelligence or talent instead of developing them. They also believe that talent alone creates success--without effort. They're wrong. Our mindset has substantial implications for our ability to learn from mistakes. When we hold a fixed mindset and believe that our abilities are inherent, we view mistakes as character flaws, and we have an strong negative emotional response to setbacks and failures. As a consequence we're less comfortable with risk and prefer to compete in settings where success (and approval) are assured. In contrast, holding a growth mindset and believing that our abilities are can be actively developed allows us to view mistakes as learning opportunities. We still respond negatively to setbacks and failures, but we're less distressed by the experience. And as a consequence we're more comfortable with risk and tend to seek out bigger challenges. Our tendency toward a fixed or growth mindset derives from our formative experiences as children and our early education and professional training, and we all have a fixed mindset in some circumstances. But Dweck's work suggests that it's eminently possible to adopt a growth mindset, and this begins with simply being aware of the difference between the two mindsets and their implications for our learning and performance. So what steps can we take to continue this process? How can we learn how to learn? The concept of mindset is a type of mental model--a conceptual framework that we employ to explain some aspect of the world to ourselves. In this case, mindset is a model about ourselves that we use to understand our abilities and how we perform. Mental models are not neutral--they have a significant impact on our experience--but in most cases they're adaptive, enabling us to navigate situations and accomplish our goals more effectively. As a result our mental models typically operate automatically and unconsciously--we don't think about them any more than we think about breathing. The key step here is simple in theory but often challenging in practice: To surface and examine this particular mental model, and to deliberately and consciously see ourselves as a work-in-progress. An obstacle here is the traditional view of human development, which holds that our brains cease growing after adolescence along with the rest of our bodies. But an extensive body of research in recent years on neuroplasticity has demonstrated that our brains actually retain the potential for developmental growth and change throughout our lives. The idea that we're a work-in-progress, which is the essence of a growth mindset, isn't merely a metaphor--it's the literal truth. Here's where we can leverage the power of reframing. Our intellectual interpretation of situations in which we've encountered setbacks or made mistakes has a significant influence on our emotional experience. One interpretation is that we lack the talent or ability--a hallmark of a fixed mindset. But an alternative explanation--a way to reframe the situation--is that we simply lack experience, and with feedback, practice, and hard work, our performance is likely to improve. Note that reframing does not mean failing to hold ourselves accountable. Recall the study led by Jason Moser noted above--the people who learned best from their mistakes spent a substantially higher amount of time and energy focusing on and reviewing what they did wrong in order to learn from it. They didn't shirk responsibility or fail to hold themselves accountable--just the opposite. Photo by R. Nial Bradshaw. Yay Flickr and Creative Commons. My work as a coach often involves encouraging clients and students to talk about their feelings--a process known to psychologists as affect labeling--in order to manage difficult emotions more effectively. Experience tells us that this is a useful practice, but why? How does talking about feelings make them easier to manage? Putting feelings into words has long been thought to be one of the best ways to manage negative emotional experiences. Talk therapies have been formally practiced for more than a century and, although varying in structure and content, are commonly based on the assumption that talking about one's feelings and problems is an effective method for minimizing the impact of negative emotional events on current experience. More recently, psychologists have discovered that merely putting pen to paper to express one’s emotional ailments has benefits for mental and physical health. Although conventional wisdom and scientific evidence indicate that putting one’s feelings into words can attenuate negative emotional experiences, the mechanisms by which these benefits arise remain largely unknown. While the specific neural mechanisms involved remain unclear, it's noteworthy that this research highlights the connection between the prefrontal cortex, the region of the brain most closely associated with logical reasoning, and regions of the brain involved in processing emotion. Although this may seem counterintuitive, given our popular conception of reason and emotion as opposing influences on our behavior, it's entirely consistent with decades of research by neuroscientists such as Antonio Damasio  and Richard Davidson , whose work emphasizes the complex and intertwined relationship between these modes of mental processing. So while we can't explain the underlying mechanisms with absolute certainty, a highly plausible theory has emerged over the past decade that allows us to explain why talking about distressing feelings mitigates the counterproductive impact of those emotions. How can we make more effective use of these ideas? Many of us lack experience talking about our feelings, particularly in a professional setting, and just thinking about it can trigger a sense of anxiety and unease. This response is understandable--being called "emotional" is typically a criticism in business, and yet it can be unclear what would cause that label to be applied to us. But in our efforts to avoid this outcome, we may over-correct and never disclose our feelings at work--which prevents us from leveraging the neural processes discussed above, making our negative emotions even more difficult to manage. Psychologist Daniel Wegner quoted educator John Dewey on the importance of routinizing desired behaviors: "Habits must intervene between wish and execution in the case of bodily acts, [but] we still cherish the illusion that they can be dispensed with in the case of mental and moral acts." [8, emphasis added] The key here is recognizing that talking about emotions is a bodily act, not just a mental one. By definition emotions aren't purely cognitive processes--we often become aware of our emotions when we suddenly feel our heart pounding or a pit in our stomach. And just like any other embodied experience that involves multiple physiological systems, like driving a car or public speaking, we must make it a habit in order to grow accustomed to the challenge. But the good news is that practice inevitably increases our comfort with discomfort and reduces our self-consciousness as we grow more competent. A consequence of our inexperience with discussing emotions--and a contributing factor that holds us back--is a limited emotional language. Even when we're ready to talk more fully about our feelings, if we lack the precise word to convey our emotion to another person in such a way that it has the intended impact, we're likely to struggle. A simple solution is to expand our emotional vocabulary. This one-page document lists eight primary emotional states--angry, averse, caring, embarrassed, excited, fearful, happy, inadequate, and sad--and 52 synonyms. Psychologists differ on the nature and number of primary emotions--Paul Ekman defined the six basic emotions as anger, disgust, fear, happiness, sadness, and surprise, while the late Sylvan Tompkins believed there are eight: anguish, disgust, fear, joy, interest, rage, shame, and surprise. I've adapted this list from one originally developed by David Bradford, Mary Ann Huckabay and Carole Robin at Stanford, and I find that it works well for my clients and students. As Lieberman's work indicates, and as ample empirical evidence makes clear, merely reflecting on our feelings also allows us to regulate them over time. But the process of internal reflection appears to work less efficiently than openly discussing our feelings, and in many circumstances it's simply not possible to pause the interaction in order for us to take time to reflect. If we want to manage difficult feelings as effectively as possible, we need to talk about them with others--including those people who may be the cause of our emotions. And yet even if we're willing to have this conversation with a rich vocabulary at the ready, our ability to do so will be significantly influenced by the surrounding culture. Note that every relationship and group has its own culture--a set of norms, often tacit and unspoken, that determine what behaviors or statements are acceptable and what will result in embarrassment or threat. If we want to make full use of the neural processes described above, we have to create a safe, trusting and intimate culture in which talking about feelings is accepted as normal. I fully recognize that this may involve taking some risks in order to move the culture in the desired direction, and I'm not suggesting that we do so heedlessly. But what gives me hope is that the bold act of talking about our feelings is what tends to create a safer, more trusting, and more emotionally intimate culture in the first place. Social: Why Our Brains Are Wired to Connect (Matthew Lieberman, 2013) I highly recommend Social as a lucid and thought-provoking guide to recent neuroscience research on a wide range of issues beyond the topic of this post. When I taught Interpersonal Dynamics (aka Touchy Feely) at Stanford, I included chapters from Social on my syllabus for the first and last classes in the course. This is a revised and expanded version of a post first published in February 2008. Thank you to Stephanie West Allen for helping me grasp the implications of current neuroscience research for my work as a coach, and, more specifically, for initially referring me to the work of Matthew Lieberman, Naomi Eisenberger, and their colleagues at UCLA. Photo by Gideon. Yay Flickr and Creative Commons. Mindfulness need not be viewed as an esoteric or mystical subject, although it's often perceived that way. It's merely the process of noticing what's happening around us, observing where our attention is going as a result, and sensing our cognitive, emotional and physical responses. A heightened sense of mindfulness allows us to direct our attention toward an intended object of focus and away from undesirable distractions, which can have a significant impact on our professional effectiveness. We can cultivate this ability through a number of practices, most notably meditation. A key is viewing meditation as a workout in attention management rather than as a break from the stress of daily life. It can be challenging, but like any workout, the difficulty is the point of the process. Consistent practice is essential, but meditating for just a few minutes a day can be sufficient. One way to begin is to block off just a few minutes--no more than 5--at a regular time of day when you won't be interrupted, set a timer, sit or lie comfortably, close your eyes, and focus on what it feels like to breathe. You will almost immediately be distracted by a thought, feeling or sensation--this is expected and part of the process. Notice what's distracting you, acknowledge any response you're having as a result, and return your attention to your breathing. This will happen repeatedly and probably throughout the entire experience, which will make it mildly stressful and somewhat unpleasant. Again, this is expected and part of the process. When the timer goes off, you won't feel anything other than a sense of relief that it's over and a concern that mindfulness is a waste of time. You'll be reluctant to repeat the process because you're a busy person, and this is the critical moment: You can allow those feelings to dissuade you from trying again, or you can try again despite your resistance. If you persist and make this practice a regular habit, your feelings about the process will not change much, nor will you observe any obvious results, for weeks or even months. But slowly, eventually, it will get easier, and you will likely notice subtle shifts in your ability to manage your attention, maintain focus, and remain calm under stress. I know I'm not making it sound very appealing, but I think it's essential to be blunt here. Too often mindfulness is portrayed as a sort of spa treatment, which gets people engaged but also leads them to give up when it turns out to be something quite different. The remainder of this essay explores the concepts referenced above in greater depth, but you need not read any further to get started. 3. "The perfect is the enemy of the good." While Voltaire certainly wasn't considering a meditation practice when he penned this line, it's highly applicable. Mindfulness practices--and meditation in particular--can seem like the domain of experts, inaccessible to people lacking specialized training. Many clients and students I talk with are interested in the concept, but also feel daunted at the prospect of getting involved with something that seems to require major investments of time and effort, or even a radical change in lifestyle. In part this stems from our association of mindfulness with figures at a distance from contemporary professional life--master monks and spiritual seekers. While we may admire their dedication and commitment, we may also mistakenly conclude that mindfulness is for people have little interest in following an ordinary career path. My own perspective on this changed when I heard Bill George talk in 2009, and he noted that he and his wife had meditated daily for the past 30 years. Bill was the CEO of a public company for over a decade and has taught at Harvard Business School since 2004, and he comes across as a grounded, straightforward person who's squarely in the mainstream of corporate life. I've met many others like him over the past decade who view mindfulness as not merely compatible with their identity as professionals, but as a contributor to improved performance. Even after we've begun exploring mindfulness practices, Voltaire's warning remains relevant because of the all-too-common feeling that we're somehow inadequate and not up to the task. We may begin meditating and find it impossible to "clear our mind," leading us to conclude that we're just not "good" at it. But the idea that "clearing the mind" is an achievable goal is rooted in a misunderstanding. Unbidden thoughts and feelings will constantly distract us when meditating, and the task of noticing these distractions and returning our focus to its intended object is the whole point of the process. The distraction doesn't make us a "bad meditator"--it makes us a human being. The definition of mindfulness that I find most helpful is nonjudgmental awareness and acceptance of experience. There are many different purposes this awareness can serve, but the function that's been most relevant to my clients and students over the past decade is attention management. As a coach I've come to view attention as our most precious resource--one quite distinct from time, which we often use as a proxy for our attention because it's easier to measure. But we often have little awareness of where our attention is going or find it difficult to maintain our desired focus. We can overcome these challenges through conscious effort, for a time, but that's fatiguing and impossible to sustain indefinitely. What’s needed is a heightened ability to sense where our attention is being directed and to assess whether that focus is aligned with our intentions, both in the moment and over time. Here mindfulness practices can play a uniquely helpful role. The definition I cite above refers not only (or even primarily) to our external experience--the world around us--but also to our inner experience--our thoughts, emotions and other responses to our environment. And a greater capacity for mindfulness not only allows us to take in more information about the world around us, but also to more fully sense and understand how we’re interpreting this data and where our attention is being directed as a result. In 2000 psychologists Keith Stanovich and Richard West coined the terms "System 1" and "System 2" to describe distinct reasoning processes in the brain , a model later popularized by Nobel laureate Daniel Kahneman. System 1 is automatic, unconscious, and fast, while System 2 is controlled, conscious, and relatively slow. It's inaccurate to characterize System 1 as "emotion" and System 2 as "logic," because emotion plays a role in both processes, but the former generates a host of "impressions, intuitions, intentions, and feelings," in Kahneman’s phrase. Some of these System 1 responses prompt immediate action, while others are assessed more deliberately by System 2. An advantage of this arrangement is that System 1 can take in a tremendous amount of data from our environment and generate numerous responses simultaneously, which allows us to take action quickly and efficiently, with a minimum of conscious thought—in effect bypassing System 2. But in some circumstances, particularly when we’re under stress, we’re better served by slowing down our automatic System 1 response and engaging System 2 to assess the situation more thoughtfully and choose our response more deliberately. A challenge is that System 2 lacks System 1's parallel processing capacity and must work sequentially, focusing on one issue or problem at a time, which can create a bottleneck when we’re operating in a fast-paced environment. In addition, both Systems 1 and 2 are subject to a number of cognitive biases, systemic errors in how we think that lead us astray even when we believe we’re being careful and deliberate. A greater sense of mindfulness helps us manage these difficulties in a number of ways: we’re better able to acknowledge our System 1 responses without immediately putting them into action, we can slow down  and engage System 2 more readily, and we’re more aware of the cognitive biases that distort our thinking in both modes. One of the most significant benefits of mindfulness practice is heightening our awareness of feelings—not only emotions, but also physical sensations. The two are directly connected—emotions manifest themselves as physiological events before they register in consciousness. As noted above, such heightened awareness can at times allow us to bring our deliberative System 2 to bear on an automatic System 1 response, but the goal isn’t to try to bring our emotions under conscious control, which would be neither possible nor desirable. A critically important role that emotions play is to act as "attention magnets"—to interrupt conscious thought and orient us toward something in our environment that is likely to be significant. The ability to control our emotions would undermine this function and actually jeopardize our survival, given the slowness and inefficiency of conscious reasoning. Nor would we want to heighten our awareness of physical sensations too far--beyond a certain point such sensitivity can be uncomfortably distracting and even painful. But many of us often operate at the other end of the spectrum—we're out of touch with our emotions and poorly attuned to our bodies, and so we have difficulty interpreting our feelings, or they build in strength and then catch us by surprise. Mindfulness practices create an environment in which there are fewer external distractions and it’s easier to sense our inner feelings. We can pay close attention to our breathing, feel our heart beat, and be more aware of visceral responses or muscle tension—and we can more clearly grasp the emotions that accompany these sensations. We begin to make associations among these various feelings and the thoughts and ideas that may have triggered them. I think of this as "lowering the waterline"--increasing our ability to notice and observe mental and physical processes that ordinarily occur on the margins of consciousness. There are other ways to pursue mindfulness—see below—but meditation deserves special mention. We often think of meditation as a complex process shrouded in mystery. In part this derives from the historic connection between meditation and spirituality—most religious traditions possess a set of practices that either involve meditation or evoke a meditative state through prayer or ritual. And yet while some people find it beneficial to integrate meditation more fully into their spiritual life, the two are not inextricably linked. When we examine meditation in isolation from any spiritual context, it emerges as the straightforward process of simply noticing where our attention goes and observing our response. This is a reductive description, to be sure, and there are many different views on the practice, but demystifying it in this way can make it more approachable for those who haven’t tried it before and help to clarify the potential benefits for professional effectiveness. Another challenge with mindfulness is the way that it’s portrayed in popular culture. It’s typically associated with rest and relaxation—a break from the stress of daily life. This poses a dilemma, especially for beginners, because mindfulness practices—meditation in particular—can be stressful. The approach to meditation that I’m discussing here involves focusing our attention on a given object, such as our breathing, or even just a spot on the wall. Almost immediately after beginning to meditate we’re inevitably distracted by a thought, an emotion, or a physical sensation—and this will happen repeatedly in the course of every meditation session. The task we face is to notice that we’ve been distracted, to let go of this new object that our attention has been drawn to, and to return our focus to its original object. And we’ll have to do this over and over and over again. This is repetitive, boring, and even stressful. And that’s the point, because meditation is a workout in the process of managing our attention. It’s not a break—it’s not a soothing shelter from distraction, but rather a stressful, head-on encounter with all of the spontaneous thoughts, feelings and impulses that distract us constantly. This approach is problematic in two ways: First, it’s much easier to commit to a mindfulness practice when it’s truly habitual—when we’ve created a set of routines and triggers that generate an automatic response that makes it more likely that we’ll follow through on our intention. The more we have to stop and consider whether or not we’re going to meditate, the less likely we are to actually do it. The second problem is that inconsistent practice doesn’t appear to yield the same benefits as a daily routine, even if we meditate for longer periods of time. Current research suggests that there’s something important about a consistent practice—the closer to daily the better. This is a companion piece to Get Moving! (Exercise for Busy People). Revised March 2019. We've all heard variations on this post's title, but it's often mistakenly attributed to Dwight Eisenhower or Lewis Carroll. Actor, director and producer Martin Gabel deserves the credit. Photo by Strevo. Yay Flickr and Creative Commons. The impulse to hurry should often be interpreted as a signal to slow down. Our culture worships speed, particularly in the business world. We sing the praises of instant communication, always-available downloads, and same-day delivery as if they were miracles, and we curse the slightest interruptions in our expectations of immediacy. But a problem posed by speed is that the reflexive responses we feel under stress—in a crisis, or when engaging in conflict--are often counterproductive, making it more difficult for us to achieve our goals. We react quickly and impulsively, when we would be better served by slowing down and choosing a more thoughtful response. I’m not suggesting that speed is always undesirable. In many difficult situations it’s more important to make a good-enough decision and take action, and if we allow the perfect to be the enemy of the good, the delay will cost us. Nor am I suggesting that we always perform worse under stress—up to a point the opposite is true, although once that threshold is crossed our effectiveness often declines rapidly. We tend to feel an increased sense of urgency when we encounter a situation that we perceive as threatening in some way, and the threat response (aka fight, flight or freeze response) that we’ve evolved to navigate these situations can lead us in precisely the wrong direction. When we’re in the grip of a threat response we experience a host of physiological and psychological reactions: our heart rate and blood pressure escalate, we’re more likely to feel fear and anger, and we process information more quickly, all of which prime us to make decisions quickly and take immediate, decisive action. But speed has a cost, and in these situations we also process information less accurately, and we’re less effective at creative problem-solving and collaboration. If we’re facing a literal threat to our physical safety we’re still well-served by rapid action, but few of us experience such threats on a regular basis in the contemporary world. It’s much more likely that we experience a threat response in the midst of a professional crisis or interpersonal conflict—what psychologists call social threat—and in these cases our inclination toward rapid action can be profoundly unhelpful. To begin with, our perception of threat may be entirely unwarranted. We may sense danger where there is none. Executive coach David Rock’s study of current neuroscience research indicates that we’re more likely to experience social threat under a specific set of circumstances: when we encounter someone of higher status or from another social group, when the outcome of a situation is uncertain, when we feel a loss of autonomy, or when we perceive an injustice. And yet these circumstances are daily occurrences in our professional lives; if we treat every such encounter as a potential threat, we experience our workday in a permanent state of vigilance and paranoia. Further, our diminished capacity to process information accurately under stress means that we’re more likely to misinterpret environmental signals and interpersonal cues, and we suffer from a cognitive bias that makes it difficult to envision missing data. Even when faced with massive gaps in information, we tend to focus on the information at our disposal and rely on it to construct an explanatory narrative, as flimsy as it might be. But a consequence is that we’re inclined to see threats where there may be none, and once we’ve come up with an explanation for the perceived threat, we’re unlikely to question our judgment and look for alternatives. So what can we do? What helps us slow down when we’re feeling a sense of urgency? Meditation is often promoted as a source of stress relief, when in practice it can actually be unpleasant and even distressing to try to "clear our minds" only to find that thoughts and emotions immediately distract us again. It’s more helpful to view meditation as a workout in managing our attention, and, like any tough workout, it’s not always going to be easy or fun. But the process of repeatedly noticing where our attention is focused and gently re-directing it strengthens our ability to do the same when we’re in the grip of a threat response. Among many other benefits, regular physical activity helps us be more attuned with our bodies. The significance here is that the feelings of anxiety, fear, frustration, and anger that can accompany a threat response have many physiological elements, and our ability to sense these cues earlier and more acutely can help us be more aware of a threat response in the moment. Our ability to do any of this work is enhanced when we’re well-rested and impaired when we’re sleep-deprived. This isn’t news—ample research supports the importance of sleep—and yet this awareness often fails to translate into behavior change that results in better sleep hygiene. One concept that I’ve found helpful in my practice is recognizing the distinction between importance and urgency; sleep is a quintessential important-but-not-urgent activity that we need to prioritize in order to do our best work. Another idea that can help is reframing the workday as a cycle that begins not when we wake up, but when we go to bed; all our subsequent efforts on any given day are support (or not) by our commitment to this first step. The heightened degree of mindfulness and self-awareness that are required to slow ourselves down when we’re under stress require effort, and this can be uncomfortable. But if we fail to undertake this effort, if we fail to increase our comfort with discomfort, we guarantee our underperformance. We never learn what we might accomplish with a greater willingness to challenge ourselves. The good news is that when we spend time outside our comfort zones, they tend to expand. Photo by Jenny Jozwiak. Yay Flickr and Creative Commons. This process allows us to immediately interpret a situation and "make sense" of it in a way that will guide future action, and most of the time it works well; we're generally successful at navigating the world of experiences and interactions. But as effective as they are, the mental systems that evolved to do this work are as subject to errors and biases as any other aspect of our thought processes. Bear in mind that our cognitive abilities are often diminished when we're under emotional stress, such as when we're resolving a conflict or are in the midst of any tough conversation. At the very moments when we most need to make accurate judgments about a situation and about others' intentions, we are most likely to be confidently wrong. So what can we do? First, merely being aware of our tendency to ignore missing data and rely instead on readily-available information to construct explanatory narratives can be helpful. We can't turn off this mental mechanism (nor would we want to--it usually serves us well), but we can look for the errors it tends to generate. Applying the framework of the Ladder of Inference, we can drop down a few rungs and go from taking action to assessing the data that serves as the basis for our actions. We can ask ourselves: What don't I know here? What assumptions am I making to fill in the gaps? How might I challenge or test those assumptions? The ability to ask these questions in the first place rests on a foundation of self-awareness and the practice of self-inquiry. We need to be able to step outside our immediate experience and understand our habitual responses and tendencies. We need to understand and explore the mental models that we're bringing to the situation and determine whether they apply here (or are still accurate at all.) One way to do this is through journaling--even 30 seconds can be useful, when done consistently. Finally, in order to do any of this work we need to cultivate the ability to slow down, both in the moment when we're under stress, and on a regular basis to make time for reflection. I recommend meditation to my clients and students, not as a source of stress relief but as a workout for attention management. I also recommend exercise, both for its impact on our mental effectiveness and as a reflective experience. And, of course, good sleep habits are essential. Note that pursuing these activities will require us to set boundaries and say no in order to invest time in our own growth and development--if we don't make it a priority, it will never happen. Photo by Lars Plougmann. Yay Flickr and Creative Commons. NASS: [W]hen we try to revert our brains back, our brains are plastic but they're not elastic. They don't just snap back into shape. FLATOW: Can you retrain them to come back? NASS: We would love to know. It's very hard because frankly in the few studies we've tried to do it, people refuse. It's almost impossible to get a group of people who believe their lives are built around multitasking to stop for two weeks to actually see whether their brains have changed. FLATOW: What an addiction. It must be really--is it correct to call it an addiction? Bear in mind that this self-destructive behavior isn't happening in a vacuum: We are the targets of multi-billion dollar industries that are bent on capturing our attention, and we've welcomed into our lives a rich assortment of devices that are capable of distracting and interrupting us at every turn. So what can we do? Recognize that our attention is our most precious resource. Expect a return on our attention when we invest it and understand how to spend it wisely. Stop rubbernecking and allowing ourselves to be so easily distracted. Thanks to the late Clifford Nass--I never had the privilege of meeting him, but I heard him lecture once, and it was deeply thought-provoking. For additional resources, see The Art of Self-Coaching, Class 3: ATTENTION. Photo by Nathan Jones. Yay Flickr and Creative Commons. [M]indfulness is the intersection of two qualities: awareness and intention. By awareness, I mean awareness of what's going on both around you and inside of you in any given moment. Being aware enables you to act in the moment with the intention of creating a particular outcome or result. The purpose of Overworked and Overwhelmed is to make the practice of mindfulness easy, accessible, and relevant for people who feel like they're trapped on the gerbil wheel. The goal is not to turn you into a Buddhist monk or nun but to offer the knowledge that, along with simple, practical, and applicable routines, will help you align your work and the rest of your life with the results that matter most. The emphasis here is on small steps that, when taken consistently over time, lead to big results." This is exactly how I talk about mindfulness with my clients and students. A tremendous amount of research has emerged in the last few decades, which Scott cites in the book, that suggests the power of mindfulness practices to improve our ability to cope with stress, manage our emotions, focus our attention, and perform effectively under difficult circumstances. To reap these benefits we need not embrace any spiritual principles that have historically been associated with mindfulness or meditation, nor do we need to make major changes in our daily lives. As Scott notes, all that's required is a consistent commitment to some simple, regular routines. The centerpiece of this process is meditation, but Scott discusses a wide range of other activities that contribute to a heightened state of internal and external awareness, from regular physical activity and better sleep habits to breathing exercises and listening skills. And one of the book's great strengths is its open-ended, non-prescriptive approach to these practices. I talk about mindfulness, exercise, sleep, and stress reduction with almost all of my coaching clients, but I don't prescribe any particular set of practices for a given individual. We're much too complex for any single formula to apply to everyone, and Overworked and Overwhelmed respects this complexity, providing readers with a thoughtful set of possibilities and yet also recognizing that each reader must decide what will work best for themselves. Another strength of the book is Scott's voice as an author, which shows up not only in his informal, conversational style, but also in his level of personal disclosure. He reveals that in 2009 he was diagnosed with multiple sclerosis, and that his commitment to meditation, yoga, and an improved diet in recent years "literally saved my life." And he's not merely surviving; he writes that today, "I'm stronger than I've ever been before and savoring each moment of life in a way that I never have before." If you're already a committed meditator or actively engaged in other mindfulness practices, I suspect you'll still find something of value in Overworked and Overwhelmed, particularly in Scott's discussion of how these practices can contribute to a greater sense of meaning and purpose. 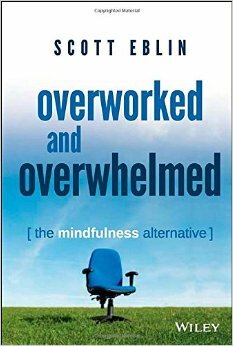 And if you've been curious about (or skeptical of) the value of mindfulness as a personal management tool, I recommend Scott's book as an engaging introduction to the topic. 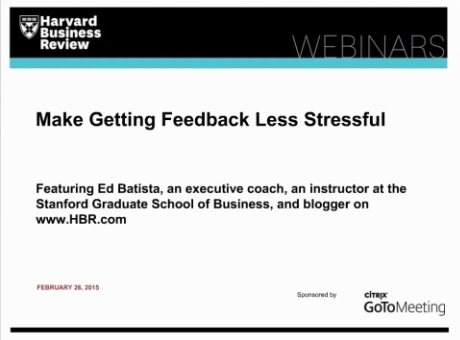 I recently conducted a 1-hour webinar for HBR on Making Feedback Less Stressful, and an archived video of my talk is now available. HBR has also produced an 8-page summary of my comments [PDF, 517KB], and you can view my slides separately. First, thanks to Angelia Herrin for inviting me to participate, to Ally Russell for her tremendous help and support, and to all their colleagues at HBR and Citrix/GoToWebinar who made it happen. Much of what I discuss in the webinar I learned through my work in Stanford's Interpersonal Dynamics course over the years, and thanks are due to to my amazing co-facilitators: Karin Scholz Grace, Sue Neville, Zoe Dunning, Inbal Demri Shaham, Chevalisa Bruzzone, Lisa Kay Solomon, Liselotte Zvacek, Erica Peng, Michael Terrell, Chris McCanna, Jimena Galfaso, Saraswathi Ram Mohan, and Agnes Le. Thanks also to my colleagues on the Stanford faculty and coaching staff from whom I've learned so much: Andrea Corney, Carole Robin, Chris McCanna, Collins Dobbs, Gary Dexter, Hugh Keelan, John Cronkite, Lara Tiedens, Richard Francisco, Ricki Frankel, Scott Bristol, and Yifat Sharabi-Levine. I'm indebted to David Rock, whose SCARF model has had a significant influence on my approach. As always, thanks to Mary Ann Huckabay, my coach and mentor.